Prepare for another alien invasion with this action-packed retelling of Independence Day: Resurgence that features an eight-page full-color insert with images from the film! 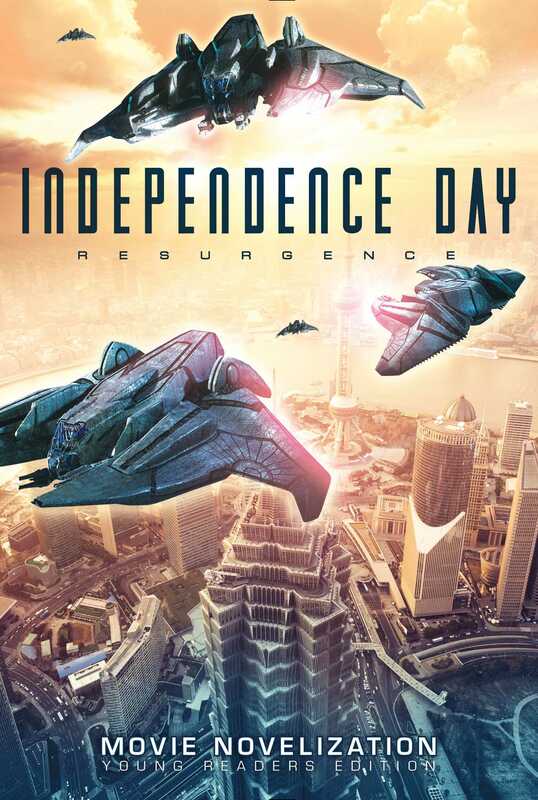 Independence Day: Resurgence—starring Liam Hemsworth, Jeff Goldblum, and Vivica A. Fox—invades theaters on June 24, 2016 with an all-new adventure! Humans are fighters. Twenty years ago, we fought off an alien invasion, and against all odds, we won. We recovered alien technology. We built a global defense system. We trained more fighters. But now the aliens are back…and this time, they’re stronger than they were before. Humankind will fight. But will humankind win? Find out in this epic retelling of Independence Day: Resurgence. Based on the Screenplay by Nicolas Wright & James A. Woods and Dean Devlin & Roland Emmerich and James Vanderbilt and the Story by Dean Devlin & Roland Emmerich and Nicolas Wright & James A. Woods and directed by Roland Emmerich. Based on Characters created by Dean Devlin & Roland Emmerich. INDEPENDENCE DAY: RESURGENCE TM & © 2016 Twentieth Century Fox Film Corporation. All rights reserved. Twenty years later people on Earth were getting ready to celebrate the anniversary of the planet’s Independence Day. At the White House—rebuilt to its former glory after the invasion had destroyed it—crews were busy preparing for the big celebration in two days. Inside the White House, President Lanford practiced her Fourth of July speech with her team in the conference room. “Thank you, Madame President,” answered Patricia Whitmore. Former President Whitmore’s daughter was only seven when the alien invasion began. She had been with her father at the time, and she knew that had probably saved her life. Her mother hadn’t been so lucky. Injured in the alien attack, she had died on July 4, 1996. Patricia would never forget that day twenty years ago. She had grown up as Washington, DC, was rebuilt. It was the only home she had ever known, and she’d moved back there after her training at the ESD Academy, choosing the White House over being a pilot in space. At that moment Captain Dylan Hiller, dashing in an ESD dress uniform, stepped into the conference room. He and Patricia exchanged a smile. Twenty years before, his father, Steven Hiller, had fought the aliens side by side with former President Whitmore. Dylan and Patricia had bonded during that time, and they’d remained friends throughout their childhood and then through their time at the ESD Academy. “Captain Hiller, welcome to the White House,” President Lanford said with a wide smile. “It’s great to be back,” Dylan said. “I can’t tell you how proud we are to have you flying our flag up there,” President Lanford continued. “It’s an honor, Madame President,” Dylan replied sincerely. “Nice to see you again, son,” said Tanner. “And I don’t have to introduce you two,” the president said when they reached Patricia. “Moving up in the world,” Dylan said as he and Patricia hugged. “Says America’s knight in shining armor,” Patricia teased. “You’re the one who’s back in the White House,” Dylan pointed out. “As an employee, I don’t quite get the same benefits as I did when I lived here,” Patricia countered. “Maybe it had something to do with the fact that my dad was commander in chief,” Patricia replied. “Dylan, be nice to Jake when you see him up there,” Patricia said before he walked away. For the first time since he’d arrived, Dylan’s face clouded. He walked beside the president and forced a smile as the camera flash popped. The aide handed a phone to Patricia, and she stared at it for a moment, wearing a worried frown. Agent Travis worked for her father. When he said something was urgent, he meant it. What was her father up to this time?